It doesn’t matter which of the six major islands you pick; you will have a beautiful setting. Before and after the ceremony, though, consider what’s available to see and indulge in. 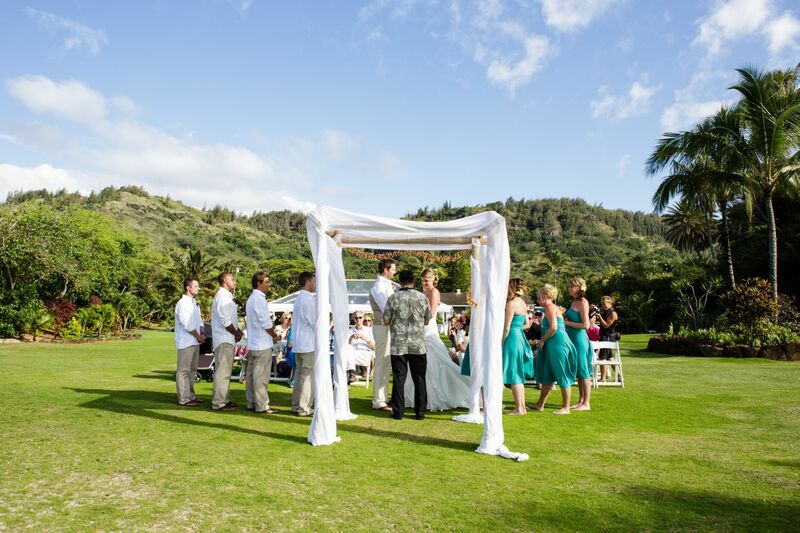 Many couples hold their ceremonies on one island and their honeymoons on another. Each island has its own aura. Here are suggestions of things that are worth your time on each of the islands, but there’s a lot more to see and do on all of them! Oahu is “The Gathering Place” with Waikiki, the awesome North-Shore surfing, Hanauma Bay and its sensational scuba diving and snorkeling, the magnificent Pali Lookout, world-class dining and shopping, spectacular entertainment and attractions galore. 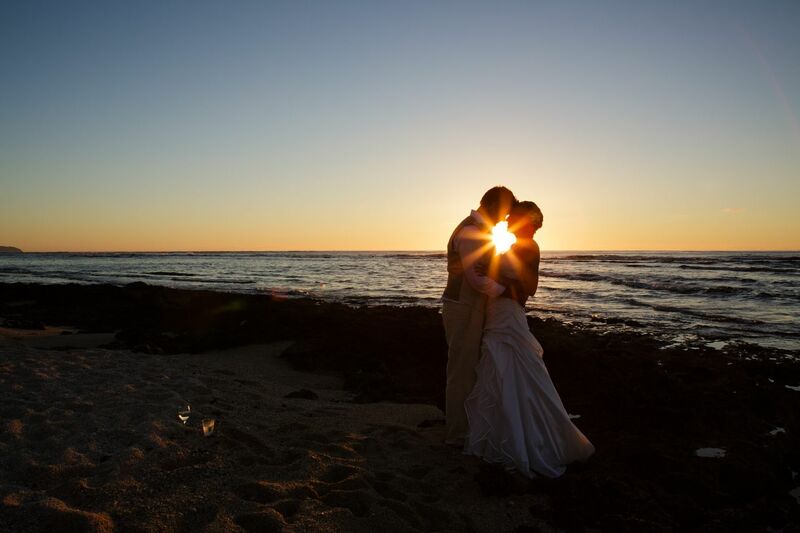 Most of the Hawaii weddings are performed on Oahu, the most populous island, and most out-of-state couples remain here for their honeymoons. Be boggled by the Napili Coast! It’s spectacular by any measure, but you need to view it from an aircraft or a boat! Poipu is always sunny, stocked with elegant shops, fine restaurants and beautiful beaches. See The Grand Canyon of the Pacific, Waimea Canyon. It’s amazing. Drive the North Shore. View the shadowy mountains, verdant valleys and stunning coastlines as you encounter one-lane bridges and the beautiful Hanalei Valley. View a volcanic lava flow up close from the world’s most active volcano in Hawaii Volcanoes National Park! Visit the Kilauea Visitor Center. View the stars and planets! Visit the Onizuka Center for International Astronomy on the way to the top of Mauna Kea. See historic attractions and natural splendor such as waterfalls and gardens near Hilo, on the east side of the island. Ride horses with the Paniolo (cowboys) in Waimea. The Kohala Coast (west) has the resorts, the spas, the shopping, the game fishing and the island’s most wonderful weather. Experience Haleakala, the world’s largest dormant volcano (large enough to contain the entire island of Manhattan). Go Upcountry — a beautiful drive, and an exposure to the “country” life on this beautiful island. Iao Valley is storybook lush, walking-friendly and where you can see the well-known Iao Needle. Browse Lahaina. It’s full of historic landmarks, unique galleries, bustling nightlife and good restaurants. Get on the Road to Hana! It’s simply one of the most beautiful drives in the world, with ocean vistas, waterfalls and lush parks to distract you from a truly exciting trek. These are the “unspoiled” islands. Each has its own personality; neither considers tourism to be its economic staple. Lanai boasts two superb golf courses and unbelievable snorkeling off its west coast. Look it as a pampered getaway. Molokai clings to its tradition. Go here for serenity, empty beaches and amazing outdoor beauty.